Maxforce Fly Spot Bait is the best choice quickly eliminate pesky flies. This product kills flies in less than 60 seconds!! 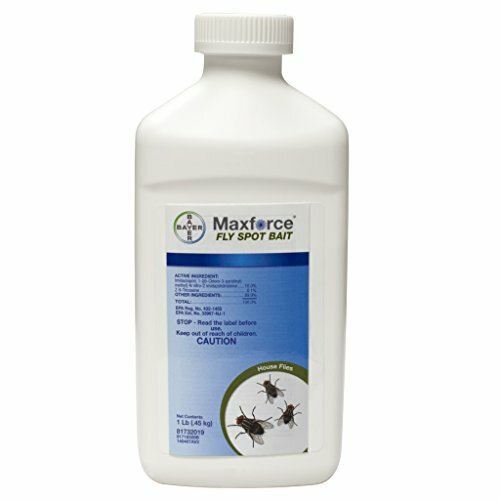 Simply take one package of Maxforce Fly Spot Bait and mix with 16 ounces of water, then spray any surface and watch the flies die as they land on the bait and feed. A great trick is to spray some Maxforce Fly Spot Bait onto a paper plate and then place the plate in area where you want the flies to die. Its that Simple! Maxforce Fly Spot Bait is for use in and around Agricultural Livestock Production Facilities, Poultry Houses, Turkey and Chicken Houses, Cattle, Sheep and Goat Facilities, Feedlots, Dairy Barns, Swine Confinement Buildings, Dog Kennels, Horse Stables, Around the Outside of Commercial and Residential Structures. If you have any questions about this product by Max Force, contact us by completing and submitting the form below. If you are looking for a specif part number, please include it with your message.